Mr. Lin Yuan-yuan was once a leading hunter for Formosa’s Bunun indigenous group. Now, he has dedicated his life to the preservation of endangered species, working as a mountain ranger based in the Nanan Station in Yushan National Park. Mr. Lin first became involved in ecological conservation more than two decades ago, when he was recruited by the park to be a ranger because of his familiarity with the habits and habitats of wildlife species and the changing conditions of the mountain forests. Since then, he has given up hunting and become an environmental hero, contributing to wildlife preservation and research. In 1996, the Yushan National Park Headquarters set up the Black Bear Preservation Task Force for the protection and research of this endangered species. With his extensive experience in the wilderness, valuable knowledge about nature and deep understanding of Black Bear habits, he frequently ventured into the rugged, dangerous mountains to help experts and researchers record the ecology of the Formosan Black Bears. His heroic endeavors have brought positive and long-lasting impacts on the continued survival of this endemic species. 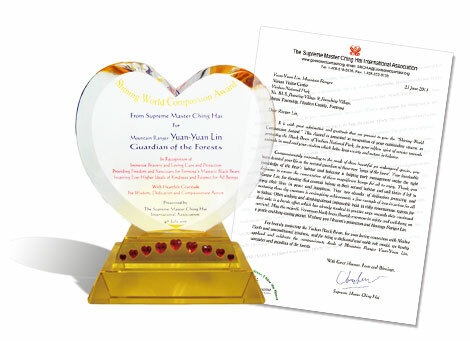 On August 26, Golden Year 8 (2011), on behalf of Supreme Master Ching Hai, our Association members presented the Shining World Compassion Award to Mr. Lin for his outstanding achievements in protecting the Formosan Black Bear, his selfless efforts benefiting animals in need, and his wisdom in helping maintain the balance between society and nature. 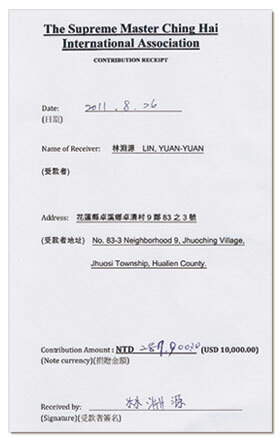 Mr. Lin also received US$10,000 from the Supreme Master to support his noble endeavor of wildlife conservation. He was very happy to receive this honor, thanking Supreme Master Ching Hai for Her encouragement. As a member of the Bunun indigenous group devoted to protecting the mountain forests, Mr. Lin embodies their spirit of love and respect for the environment. Following the ancient Bunun wisdom of living in harmony with nature, he is committed to protecting the mountains, forests and animals. 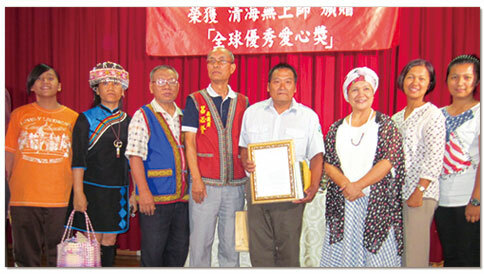 The Bunun people and the Award presentation was covered by the Taiwan Indigenous Television network, which touch Mr. Lin very deeply. All the Bunun people present felt highly honored to see him receive this commendation from Supreme Master Ching Hai. In melodious harmony, they sang the world-famous Pasibutbut—a prayer inspired by the sounds of nature—to express their congratulations to Mr. Lin and praise the noble spirit of their ancestors in protecting the forests. Their high-spirited singing stirred the heart of everyone present. We thank Mr. Lin Yuan-yuan for his compassionate and unconditional dedication to protecting the forests and enabling people to understand that wildlife will flourish and prosper only if they can continue to live peacefully in their natural habitat. We pray that the Formosan Black Bears and other wildlife in the forests will live forever on Earth under our loving protection.